is comprised of highly-skilled engineers with multiple years of experience, providing us with the expertise to tackle many challenges (Figure 1). For the past twelve years, Rovotics has successfully manufactured ROVs tailored to complete specific tasks, including scientific research and oil field maintenance in the Arctic in 2015, exploration of Jupiter’s moon and the Gulf of Mexico in 2016, and maintenance in the Port of Long Beach in 2017. This year, Rovotics presents Mako, our most versatile ROV that is optimized to efficiently complete tasks in the Pacific Northwest. Mako is fully equipped with specialized tools to locate, identify, and retrieve the wreckage of an aircraft, service an undersea earthquake-monitoring platform, as well as install a tidal turbine and a sensor array. These tools allow the ROV to identify ID numbers on aircraft parts, latch a tidal turbine securely, inflate and release lift bags, level an undersea earthquake-monitoring platform, and utilize software that calculates depth and distances. Rovotics’ design process included whiteboard drawings, prototypes, 3D models, and extensive component-level and in-water testing. We manufactured the vast majority of Mako’s components in-house with a mix of conventional shop equipment and advanced processes using a Computer Numerical Control (CNC) mill, 3D printers, and custom circuit board assembly. 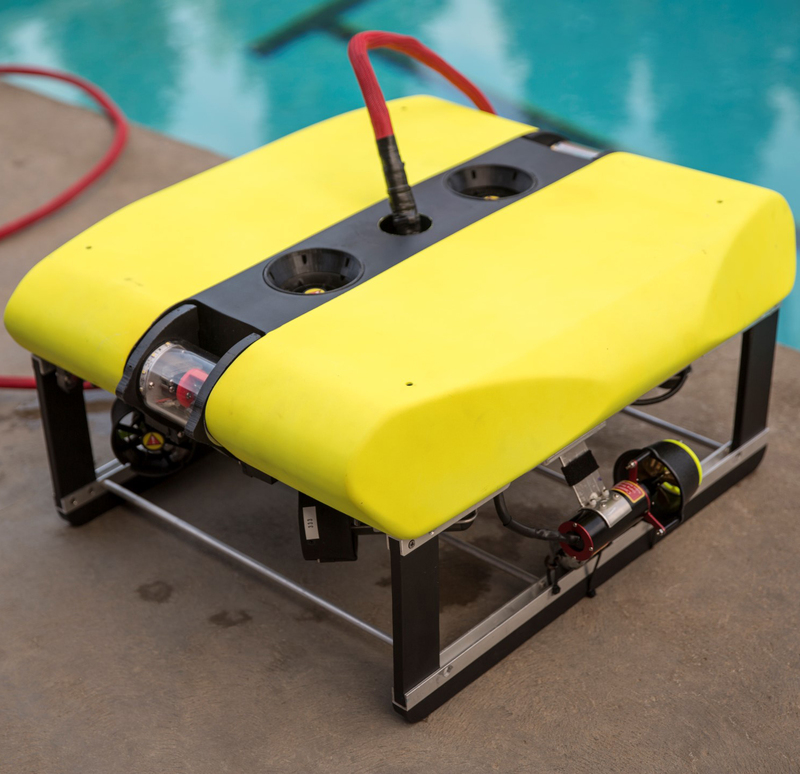 This year, Rovotics has developed a ROV designed to operate in the ocean environments of the Pacific Northwest. A rigid aluminum and clear polycarbonate structure, adjustable buoyancy, compact electronics, improved Topside Control Unit (TCU), as well as a feature-packed yet easy-to-use software interface make Mako our most versatile and advanced ROV yet (Figure 3). Optimized for modularity, Mako is designed to be lightweight, compact, and serviceable (Figure 4). Mako’s frame consists of two decks connected by four rigid aluminum struts. The top deck consists of two wings connected by four cradles and two outside sealing flanges, maximizing the usable internal volume of the electronics housing. The tool deck is mounted to the struts and is made of clear polycarbonate for a better view of tasks. Two powerful thrusters are mounted on the top deck, increasing speed and operational efficiency of the ROV. Four thrusters are attached to the four struts and can be adjusted to support a wide range of tool payloads. As a precaution, all thrusters include safety guards and labels. Mako’s buoyancy consists of the electronics housing, four adjustable tubes, and removable foam modules. The electronics housing is an integral part of the frame’s structure and also serves as the main buoyancy component of the ROV. The four adjustable buoyancy tubes consist of pistons that slide through the tubes, changing the water displacement. Additional foam modules are added and subtracted to vary the buoyancy. This system enables Mako to handle a varying tool load in different working environments. Mako’s Compact, Organized, and Removable Electronics (CORE) was designed to provide reliability and serviceability, include a wealth of safety features, and come in an incredibly compact package. This flexible electronics system allows for modular components that increase operational efficiency and decrease downtime, a critical factor in any successful ROV operation. Additionally, the compact electronics plays an important role in providing the flexibility required for the adjustable buoyancy system. A highly visible LED ring uses different colors to communicate Mako’s operational status to the deck crew, further enhancing ROV safety. Other safety features are also implemented in the power supply systems, such as overcurrent and short circuit protection. Our new TCU was designed for improved deck crew operations. The TCU is efficient and streamlined, housing all components in a portable Pelican case. A fully-customizable touch screen allows the TCU to accommodate additional functions through software updates rather than hardware changes. The TCU contains modular components to ensure field serviceability, and two large HD monitors display a live video feed and controls for the pilot and copilot. Our redesigned pilot and copilot interface was designed to display real time ROV status in an easy-to-read format. The flexible software design allows for easy expansion or removal of ROV functions. Software safety features are used to detect events such as ROV communication loss, power loss, or system crashes, and to ensure that the ROV always defaults to a safe operating mode by disabling all thrusters and tools. Furthermore, the pilot system and ROV software work in tandem, providing smart safety features that monitor unforeseen conditions and react accordingly. At 30cm x 58cm x 58cm, Mako is Rovotics’ most compact ROV yet due to decreased electronics size. This compact size and portability increases Mako’s versatility in a variety of situations and ability to maneuver precisely without losing ROV power. Mako’s adjustable buoyancy makes it easy to add or subtract from Mako’s existing tool load. Precise adjustment of buoyancy distribution is available from four adjustable buoyancy tubes and four sheets of layered buoyancy. The most advanced ROV to be produced by Jesuit Robotics, Lazarus is a multifunctional ROV that utilizes SMART tools, our new IP camera system, custom-made electronics, and innovative software to accomplish a variety of tasks with ease. With over a hundred hours of component level unit testing, Lazarus is prepared to complete a task consistently. All of our ROV designs begin on the whiteboard with a sketch. We then transfer our hand drawn sketches, into detailed CAD files. Our team decides whether we should machine the part in house or outsource the manufacturing. This year, we designed our ROV with portability and serviceability in mind. Compact and lightweight, it can reliably perform a variety of tasks in the Port of Long Beach. Modular design makes Lazarus highly field serviceable. Our new Tether Control Unit, or TCU, is the communications and power hub between the ROV and control computers. The TCU houses safety and communication devices while providing vehicle status information to the operators. The TCU conveys information such as ROV status, temperature, and other telemetry. The TCU's case allows for easy transportation, setup, and reliability due to its durable and contained structure. Lazarus' lightweight tether is designed to transport necessary signals, power, and pneumatics from the TCU to the ROV. The tether is wrapped in a flexible but durable sheathing that protects the lines within. Using strain protection on our TCU prevents unwanted stress on cables running down to the ROV. Lazarus’ control system consists of two platforms – topside software running on a Raspberry Pi, and bottomside software running on embedded micro-controllers. This year the topside structure is running on a web server using Node.js. The bottom side software communicates with topside in real time via User Datagram Protocol (UDP). Lazarus has four micro controllers, ROV1, ROV2, ROV3, ROV4, that each have independent code that allows them to complete individual tasks. ROV1 receives data from topside and relays information to the other micro controllers. ROV1 also controls thrusters and video switching. ROV2 reads data from various sensors within Lazarus. ROV3 reads telemetry data, including the IMU and controls the multicolored LED Display. ROV4 controls task specific tools. Lazarus’ electronics systems were designed with performance, serviceability, and safety as priorities. Calculating power consumption for each device allow Lazarus to operate with maximum efficiency. Continuing our multi-year electronics design evolution, all microprocessing controller boards were designed and assembled by Rovotics rather than purchasing commercial micro controllers. Each custom microcontroller contains all components necessary for its specialized function, eliminating the need for more costly and bulky stacked Arduino shields. The main microcontroller board handles critical functions such as thrusters, camera switching, communication with daughter boards, and ethernet communication to topside. Subcritical functions are divided between three modular expansion cards, minimizing thruster, tool, and sensor response times. The modular expansion card system cuts down on troubleshooting and repair time, as circuit boards can be replaced easily and inexpensively. To enable a flexible camera system with improved pilot perspective two pilot and six task cameras are controlled using a custom video switching board. The electronics connect to the subframe and tether using a combination of wet-mateable SubConn and permanent Blue Robotics connectors, which have both proven reliable on our previous designs. Blue Robotics connectors are also reasonably priced, making them an ideal choice for purchase over in-house manufacturing wherever a permanent connection is needed. Lazarus is equipped with six thrusters in a vector configuration, giving the pilot omni-directional control. Four thrusters are mounted at 45 degree angles on the corners of the top deck, with two on the mid-plane for verticals. This allows for unobstructed water flow and gives the pilot very responsive controls during operations. Lazarus utilizes T100 thrusters, which we found weigh less and are more cost effective then building our own thrusters. Each thruster was stress-tested for two hours to ensure proper thrust capabilities and compatibility with the ROV's voltage converters. Pilot perspective and Specialized Mission Assist ROV Tool Technology, or SMART-Tech, guided our design process for all tools. We designed our camera system to enable the pilot to see both the mission tool and objective simultaneously, and all tools were designed to help the pilot easily engage with each objective in seconds. Lazarus’s custom multifunctional gripper was designed to quickly and efficiently complete a variety of tasks. A pneumatic piston opens and closes the gripper’s jaw, and SMART-Tech custom cutouts adapt to different objects and hold them securely in place. A magnet on the jaw makes pulling the platform pin simple, and a dedicated camera gives the pilot a wide-angle view of the objective while keeping the tool in sight. Our innovative valve-turner uses a three-pronged appendage to rotate the faucet. A SMART-Tech alignment cone and strategically placed camera help the pilot easily guide the tool onto the faucet, and the faceted design keeps it engaged even if the ROV shifts position. During underwater trials, we discovered that the cone can also be used to efficiently push the fountain locking mechanism open and closed. Our new, bayonet-sealed motor housing was reverse-engineered from the shaft seal design used on SeaBotix thrusters, and is one-third the size of our previous designs. The motor is available in a variety of RPM’s and torques, making the entire assembly adaptable to a wide range of applications. Lazarus’ core sampler is placed near the ROV’s center of mass to allow for more precise alignment and maximum downward force, resulting in larger and more secure samples. The central location and overall design is the result of three years of development and testing after recognizing ways of improving upon past designs. A dedicated camera and SMART-Tech alignment cone assist the pilot in guiding the ROV into place directly over the middle of the sediment. The thin-wall stainless steel collection tube is oversized to gather samples larger than 150 ml, which are held in place via suction from a one-way check valve. The entire tool is easily detachable from the ROV via a twist mechanism with magnetic lock. Our harvester is a multifunctional tool designed to efficiently collect objects such as clams and beacons. A bottom shelf with a sloped edge uses hydrodynamic force to push objects into a cage. A swing gate operated by the gripper ensures objects are securely contained after collection. A cool-white LED RFID activation light, RFID sensor, and red LED simulated raman spectrometer have been combined into a compact array centered at the front of the ROV to optimize pilot perspective. Each light is potted with clear epoxy in an aluminum heat sink to prolong diode life, and the cool-white LED also serves as a general purpose work light. To maintain simplicity and reduce cost, Lazarus features a single perspective camera to accurately align the RFID sensor array as well as the buoy marker. The buoy marker securely attaches to a container holding high-risk cargo via the use of a magnet and custom carabiner. Once attached, a PVC coated nylon line unspools as the marker floats to the surface to clearly identify the container’s location. The rebar tool efficiently moves rebar using a magnetic retrieval system and pneumatic release mechanism. A dedicated camera and SMART-Tech cone allow the pilot to quickly engage with the rebar. The tool itself serves as the fourth strut of the ROV, decreasing weight and size without sacrificing rigidity. For the 2016 MATE mission at the NASA Neutral Buoyancy Lab in Houston, Texas, Jesuit Robotics developed Cuttlefish, our most advanced ROV yet. Optimized for outer space transport and designed to operate under the frozen crust of Jupiter’s moon, Europa, and in the deep waters of the Gulf of Mexico, At 17 Kg (37.4 lbs) and 58 cm (22.8 inches) in diameter Cuttlefish is Jesuit’s smallest and lightest ROV. It is fully equipped with tools for lunar exploration, oil sample recovery, deep water coral studies, and wellhead manipulation. Specialized tools include an adjustable rotating gripper, lifting clamps, a magnetic retriever, and temperature and depth sensors. These tools allow scientists to explore Europa, recover CubeSats, analyze the origins and effects of oil released by the Deepwater Horizon oil spill, and prepare an oil rig to be converted to an artificial reef. Devised for Arctic operations, Jesuit Robotics created Stingray for under-the-ice procedures and opportunities. Based in St. John's, Newfoundland, the 2015 MATE competition required an ROV that could replace pipe sections, survey icebergs and marine life, and service an underwater oil christmas tree. The exemplary feature for this ROV includes the modular subframes. Fully interchangeable, this feature allows the ROV to have three separate working modules that are easily replaced. Furthermore, this is an improvement for the serviceability of Stingray, enabling the deck crew to conduct swift repairs and operation while a subframe is under repair. Subframes were independent and fitted for each task. The accessories include two valve turners, a pipe clamp, and a laser measurement system as well as an external flow sensor known as EVE. For the 2014 MATE mission task, Predator was designed to investigate shipwrecks off the coast of Lake Huron. Some of Predator's notable features include a sturdy aluminum frame, transparent bottom platform for pilot visibility, and controllable pneumatic buoyancy. The active buoyancy allowed Predator to lift a heavy 9 pound anchor to the surface quickly and safely, and could be quickly removed as a single unit by the deck crew. The electronics can is removable without disturbing or disconnecting the electronics for easy debug and repair. Other accessories include a wine bottle recovery mechanism, a rotary shaft with flexible fingers for retrieving a plate from the shipwreck, and a salinity sensor. Designed to deploy and maintain underwater sensor networks, Leviathan included a mechanical gripper, rolling measurement device, solenoid release mechanism and a winch mechanism for retracting sensor modules. Leviathan featured modular electronics, which could be quickly removed from the robust welded aluminum container for service. It also featured a bright yellow, contoured fiberglass buoyancy device, for safety, control and to reduce snag points. The upper and lower sections of the vehicle could be separated to allow for quick replacement or maintenance of the vehicle accessories. Leviathan was used in filming for the upcoming movie, Spare Parts, debuting January 2015. Reflecting advancements in Jesuit Robotics capabilities, Triton was our first ROV to include custom made printed circuit boards, parts that were fabricated by the team members with a CNC Mill, a precision depth sensor with a complex PID-based depth control algorithm, and our first implementation of a fiberglass/polystyrene buoyancy system. Triton was designed to survey and de-fuel WWII shipwrecks and included measurement devices, a simulated sonar scanner, a pneumatic lift bag, and a complex pump and storage system to simultaneously de-fuel the ships bunkers while back-filling with water to prevent collapsing the vessel. Designed to operation at depths of up to 40 feet, Phorcys’ mission to cap a free flowing oil well at the bottom of NASA’s Neutral Buoyancy Lab in Houston, Texas. Phorcys had tools to cut a collapsed header pipe, attach a retrieval line, secure a well cap to stop a flowing well under pressure, and conduct biological surveys of the area by retrieving water samples and animal specimens from the simulated seafloor. Phorcys had an open aluminum frame to provide minimum drag, which allowed for maneuvering through the flow of the oil well. This open design also allowed Phorcys to carry the well cap near center of thrust to allow more downward force for placement, and managed buoyancy with rigid aluminum canisters which resisted collapse at operation depth.